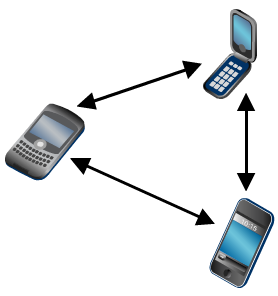 Pocket Switched Networks (PSNs) are created using short range, ad hoc wireless links between personal mobile devices. There is no other network infrastructure (No Internet!). Links rely on human mobility, and are unreliable. End-to-end paths change constantly, if they exist at all. 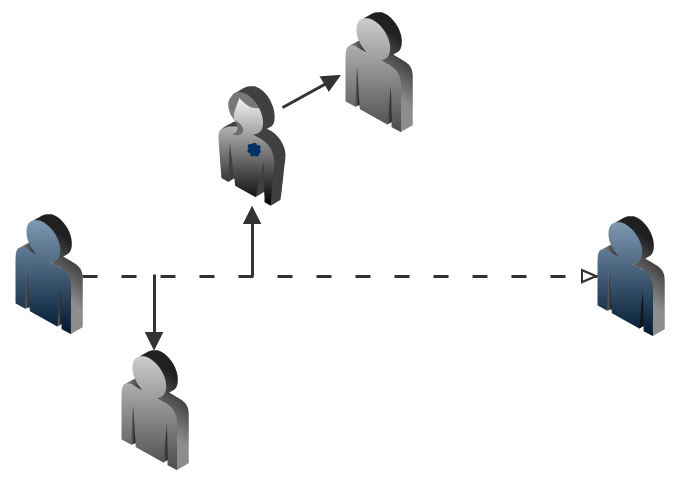 An example of Disruption-Tolerant Networking (DTN). Over 1 billion smartphones worldwide - October 2012. 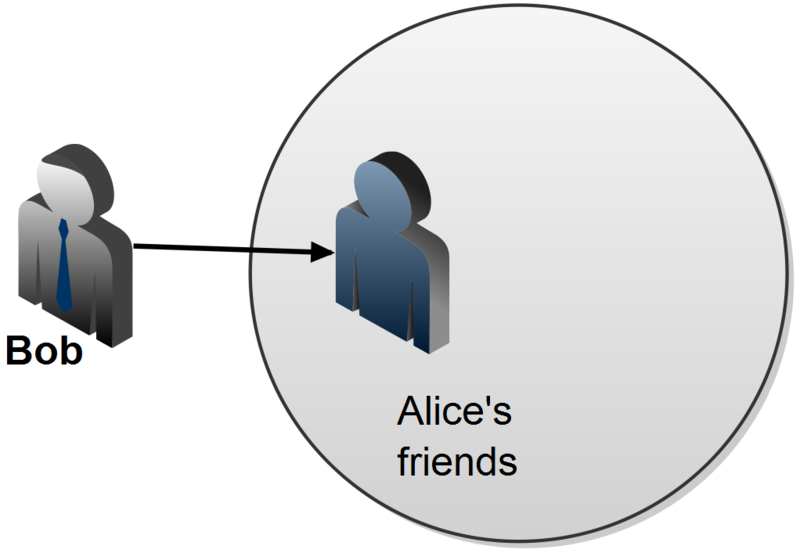 Bluetooth/Wi-Fi LP should make opportunistic message delivery between neighbours possible. Devices can use the "store-wait-forward" paradigm in DTNs. Possible new applications for smartphones. "Distributed social networking (DSN) software allows you to store and organize your own content and - optionally - share it with whoever you like." [Werdmuller]. Free (but slow) status updates over multiple hops. 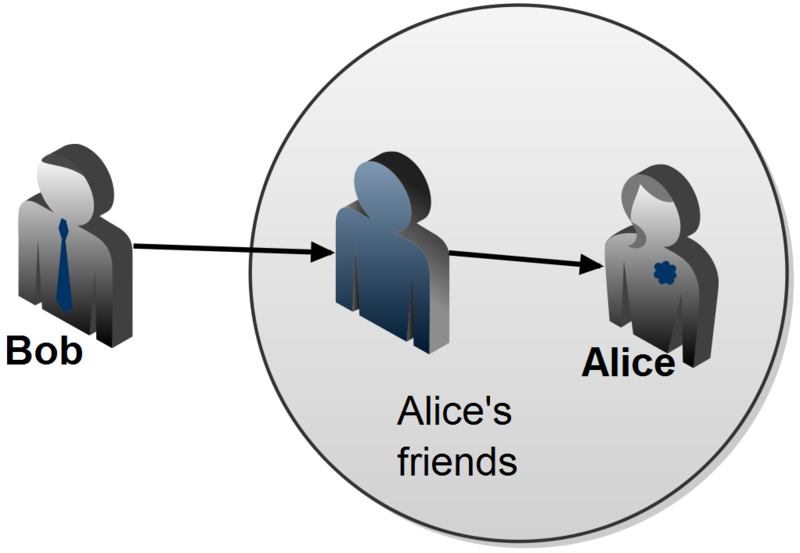 Clusters can be used for opportunistic data delivery when the probability of a device being able to deliver a packet is unknown or difficult to calculate. Based on the assumption that "people belong to their cluster groups and occasionally visit other groups" [Hui]. If social ties are known in advance, or can be gathered from online social networks, then we can label clusters [Hui, Bigwood]. Epidemic label propagation [Leung, Herbiet]. We can experiment with these methods using Reality Mining data-sets which contain encounters between humans. 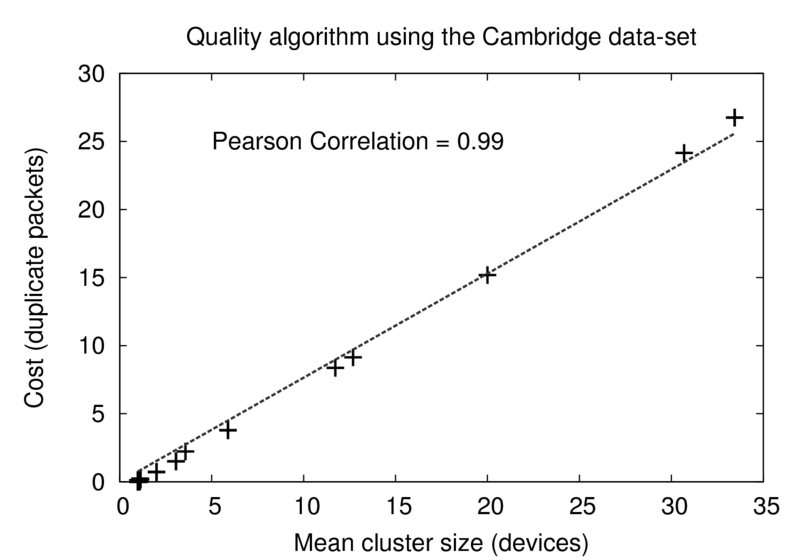 In all of these methods, mean cluster size increases over time. 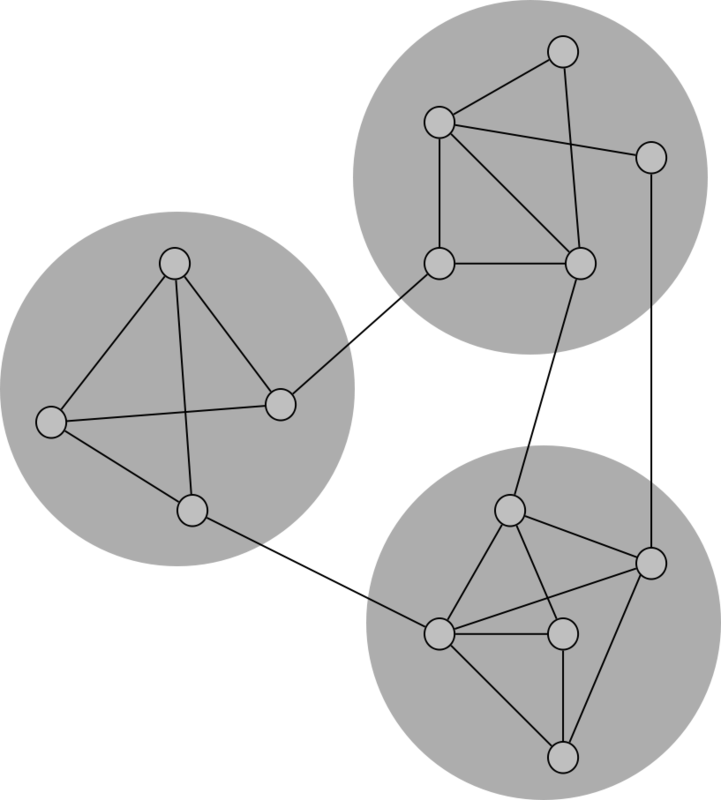 In most cases cluster size increases monotonically. Example cluster sizes over time using the Simple [Hui] cluster detection method. 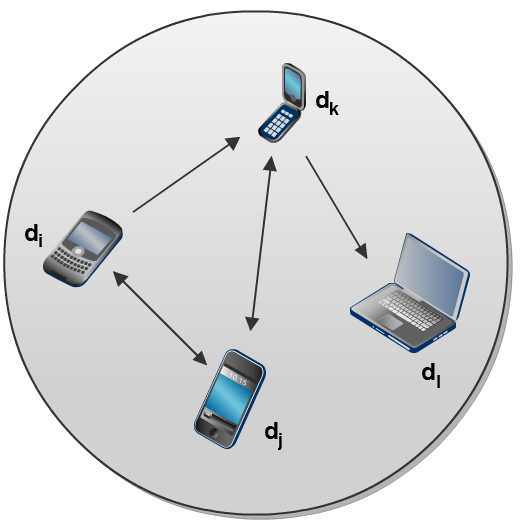 Cluster based message delivery methods copy messages to devices in the same cluster as the destination. Thus larger clusters can lead to more message duplication. Graphs with edges formed from encounters in the reality mining data-sets densify with a Densification Power Law [Leskovec] of around 1.25. 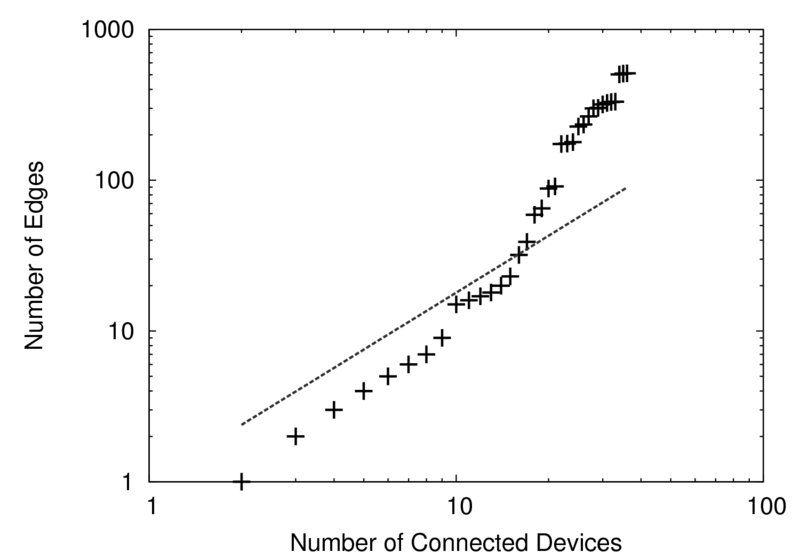 Number of edges growing with number of connected devices in the Cambridge data-set. 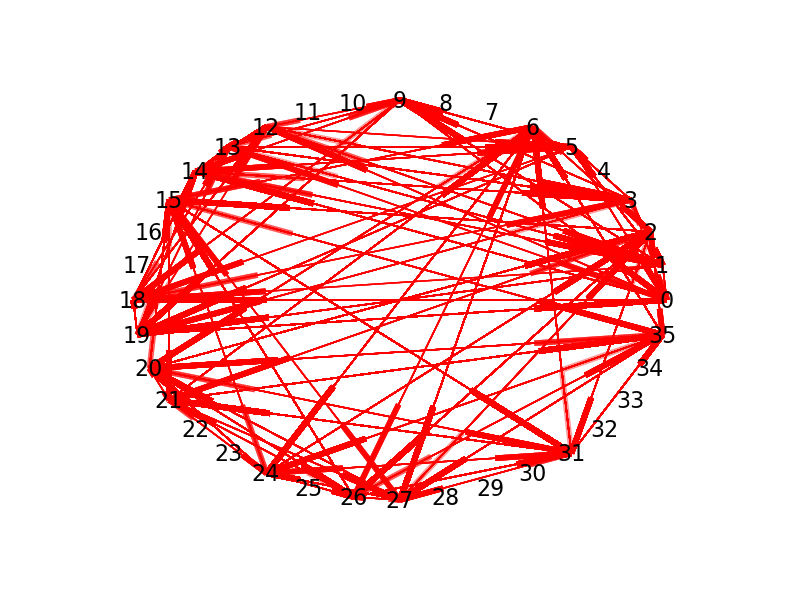 Activity within the data-sets is "bursty". Each new burst contains encounters between devices which have not met before, and may never meet again. Monotonically increasing cluster sizes means that obsolete cluster membership persists. Could clusters better reflect current network conditions instead of increasing in size monotonically over time? Each device attempts to identify recent and current encounters with other devices which have lasted longer than expected. Spatio-temporal clusters are then created. A rough estimation of the expected cumulative duration of encounters with a device during a discrete time frame. Returns an estimated mean relative to some variation in a time series. We don't have to store all the data of previous encounters, only mean values for the past w frames. 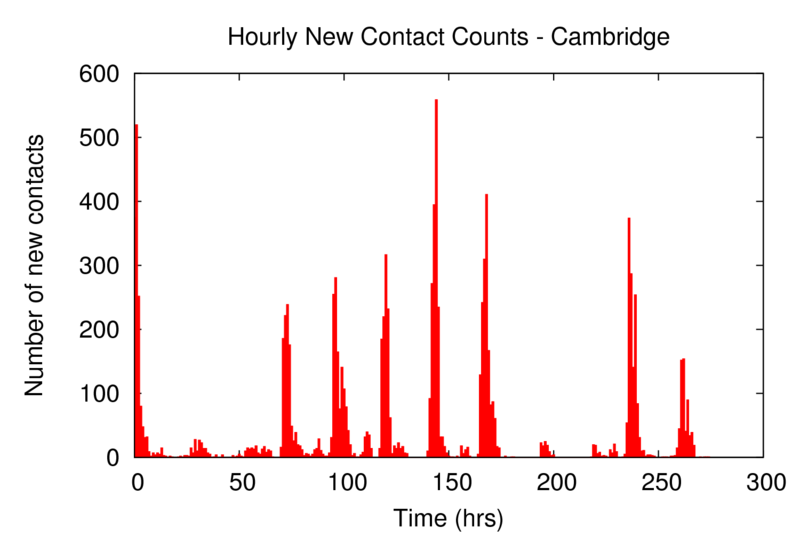 Time frames help us to measure connectivity despite the parking lot problem. 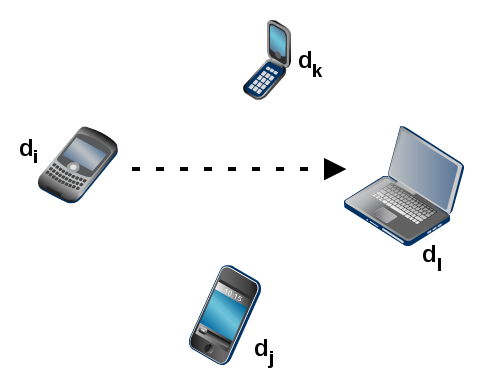 x is the cumulative encounter time between 2 devices during a time frame. Cup was added to control the size of clusers if need be. Removing devices from clusters is done at the end of time frames using the same test but in reverse. 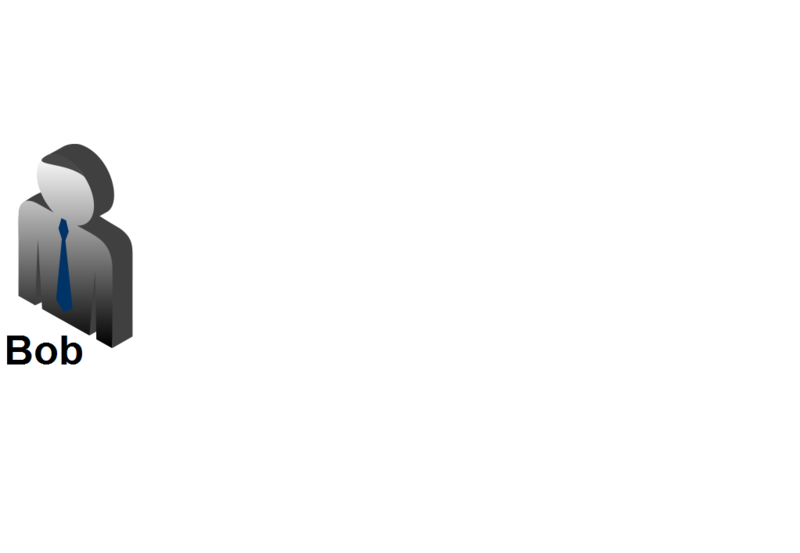 Devices are added and removed from local cluster tables using the previous tests. Local cluster tables are exchanged when devices meet and when the cluster inclusion test has been passed. Local cluster tables of neighbours are stored in the branch column. Local cluster table example for di. Examble using the Haggle Cambridge data-set. Three policies for transfering a messages upon encountering a device were tried. To explain them we'll use the example of di trying to send a message to dl. If destination (e.g. dl) is anywhere in the local cluster table of encountered device (e.g. dj), transfer a copy of the message. 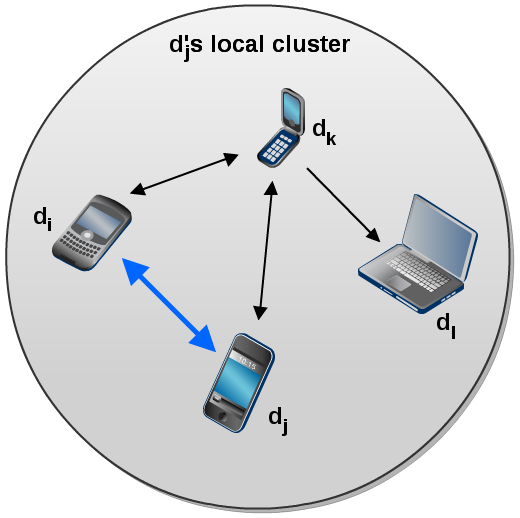 Local cluster table example for dj. If destination (e.g. 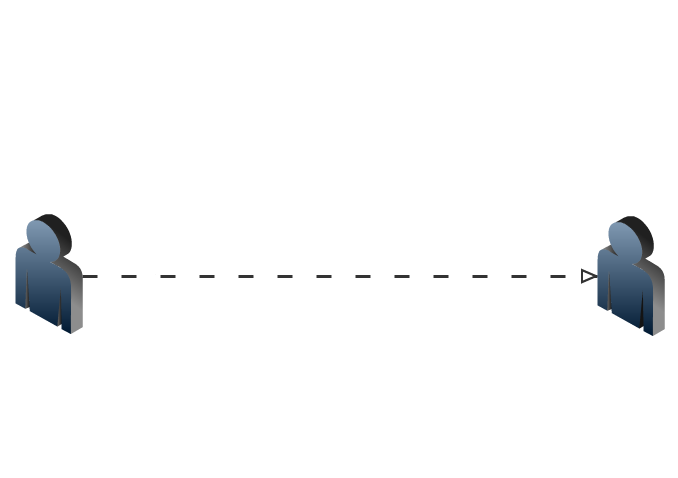 dl) is in a row of the local cluster of the encountered device (e.g. dj) which also contains the transfering device (e.g. di), do not transfer the message. 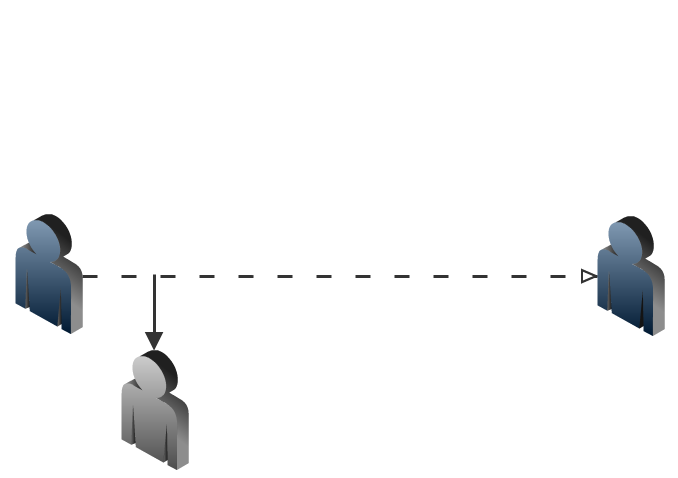 If a path to destination exists which does not appear to contain a routing loop, transfer a copy of the message. Efficiency is calculated daily by dividing the number of delivered packets by the number of relayed packets. Overheads = (Number of messages relayed - number of messages delivered) / number of messages delivered. 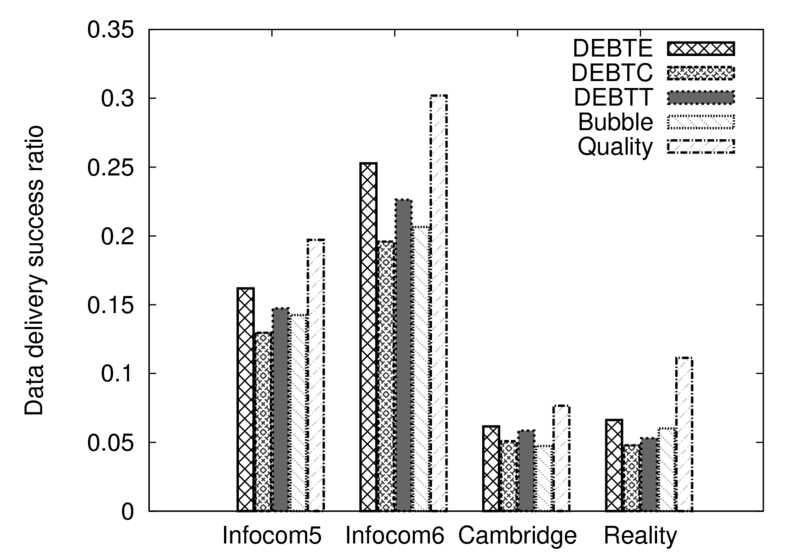 6% more packets delivered with DEBTT than Bubble, with 7% drop in message overheads. 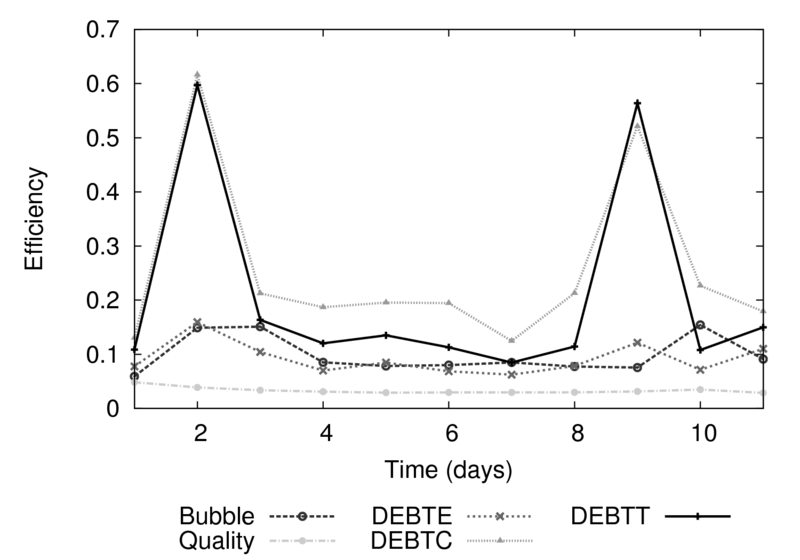 DEBTT looks the most promising. Given a little in processing overheads associated with tree traversal, but gained efficiency. 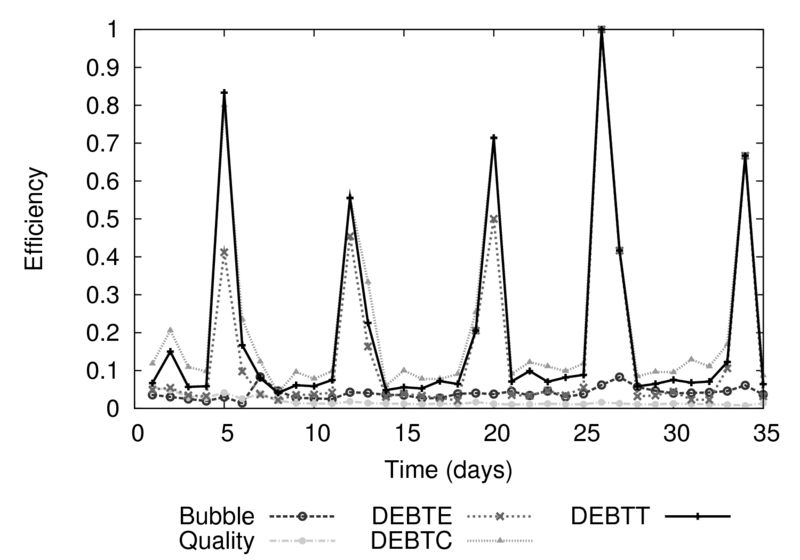 DEBTT is not more complex than Bubble which uses centrality calculations as well as clustering. Automatic frame size detection would be great. We need frames or some other mechanism to solve the parking lot problem. Human movement is mostly diurnal so it doesn't make sense to have frames longer than 24 hours. If frames size is less than 1 hour, every encounter becomes significant.